The two statuses differ greatly in their behaviour in managing calls from the PBX. You therefore need to understand the difference between the two, especially when the call arrives at a group of users. in the second case, if all users were on the status “Away”, the group would appear unreachable. It is therefore suggested that users use the DND setting when away from the workstation temporarily and it is presumed that the user will be available within a reasonable period in his/her own shift. 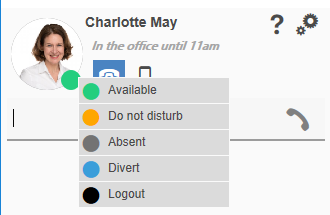 Conversely, when he/she is definitely away from the workstation (end of shift or long period of absence) use the status Away, or switch off the GUI, but while activating the User setting “Away status set on logout”.